“Without wonder and insight, acting is just a trade. With it, it becomes creation.” Bette Davis. Ed Christman always brought joy to the job. He had gift for performance, a rich imagination, and the willingness to work hard. This trio of talents made even routine tasks come to life with humor and surprise. He used performance in many ways but especially to engage students in the Wake Forest experience and its history. Ed’s abilities also allowed him explore new experiences, such as formal acting roles in the Wake Forest University Theatre. At orientation, the Chaplain welcomes the students. In the Chaplain Christman years, it was a performance. Each year, Ed gave a speech called “What’s in a Name?” at Wake Forest orientation. His speech incorporated the last name of every incoming freshman. An ambitious task — yet it showed every newcomer that he or she was already known and celebrated as a unique person even on this big, busy campus. “What’s in a name and what’s in a place? your names and your places are now connected with this name and place. … Sometimes the names and the connections are obvious. Sometimes the connections are because they are contrasts. For example, we have two skulls and a cross but no bones in the freshmen class. We have a Day and Knight and of course the Knight is Polite although he pronounces it Polite [pronounced Po-leet] and there is a Palace to live in. There is a Brush but no comb. There is a Cobb but no Corn. There is Bigger, not littler. There is Fulton but no steam. There is Green, excuse me, yes, there is Green, but there is not any blue. There is Kodak but there is no Canon for the Atlanta Braves fans. There is Least but not most. There is Parr but unfortunately no birdies. There is Sharp but not dull. There is Venable and not ignorant. This speech became a beloved institution and inspired the sincerest of compliments: a take-off! Shane Harris (’98): “I did an impression of him [Chaplain Christman] for years for ‘In Search of a Corner,’ our annual campus comedy show. It was one of our most popular sketches. We built it around his ‘What’s in a Name’ speech. Samuel Wait, a Baptist pastor, founded Wake Forest College in 1834. Ed took the history of that event and brought it to life for the Wake Forest community. He wrote a script for a one-man play and became Samuel Wait, telling the story of the round-about journey that created the college — perhaps predestined but not simple! Ed’s Samuel Wait made appearances at many events, and the story was always customized to fit each audience. 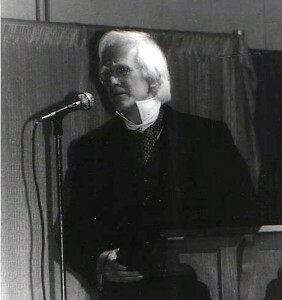 Ed’s final performance of Samuel Wait took place in 2006 at Professor Ed Henricks’ NC History class. EDC as Samuel Wait, 1983 Alumni Homecoming Dinner. My Name is Samuel Wait, by Ed Christman, was presented at the Wake Forest Alumni Dinner, fall 1983. My name is Samuel Wait and I have been given a special dispensation to be with you tonight celebrating our Sesquicentennial. It may be the only time in Wake Forest history that three presidents will be in the same room, and I count it a distinct honor to be here with Ralph Scales and Tom Hearn. You will allow me to call you Ralph and Tom? And you can call me … Dr Wait! We might be called the Wake Forest trinity — the Father (knowing pause) — and the two of you may negotiate Son and Spirit. During the 1980s, Ed was invited to become an actor with the Wake Forest University Theatre. 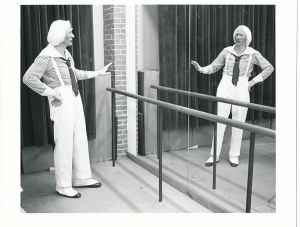 His entry onto the formal stage came from James Dodding, visiting theater director from England. 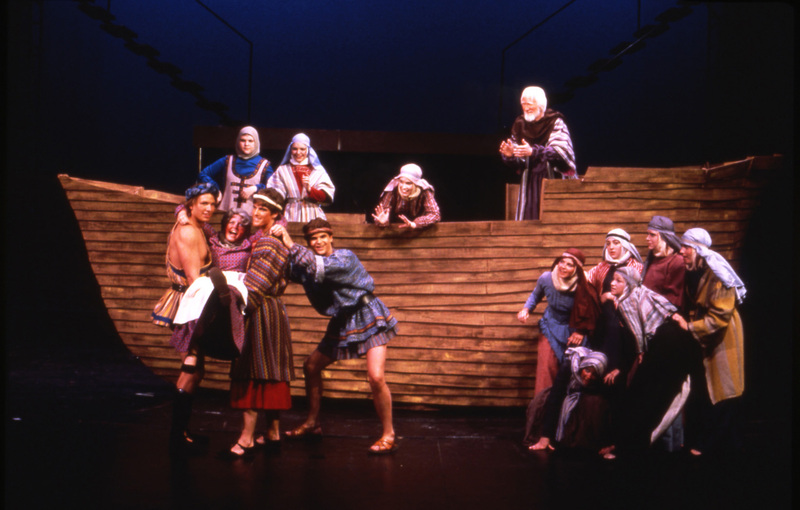 Mr. Dodding was crafting The Passion in 1981, and he thought Ed would be perfect as Noah. Ed enjoyed The Passion so much that he went on to take roles in HMS Pinafore and Guys and Dolls, which involved not only acting but singing and dancing. He also had a walk-on role in Servant to Two Masters. ♦ The Passion (1981, 1985), directed by James Dodding — Ed played Noah in the original Passion and in later productions he also played Lazarus and performed the voice of God. Kim Christman: “One of the best memories I have was when Dad was learning how to do the sleight of hand trick with the dove as Noah. He was standing inside the ark ready to send off a dove to see if there was any land. He held a prop dove and was supposed to lower it below the edge of the ark out of sight of the audience, let it sit on a ledge below the edge of the ark and then lift his hands like he was sending it off into the sky. Jeff Lindquist: “In addition to playing Noah, Ed also played Lazarus. I remember the first time I heard him ‘coming back to life.’ It was amazing to me. He did this Darth Vader-type intake of breath, very slow, and then did the same as an exhale. Then he stepped out of the tomb. I loved listening to it every night of the run. I remember Ed in all three plays that I did with him (Passion, Pinafore, Guys and Dolls) for always being so optimistic and cheerful in rehearsal, regardless of the difficulty of the scenes, and in performance. Amazing! ♦ HMS Pinafore: The Lass That Loved a Sailor (1982), directed by James Dodding — Ed played Rumbo Rowlock. In this musical, Ed learned to sing and tap-dance on stage. 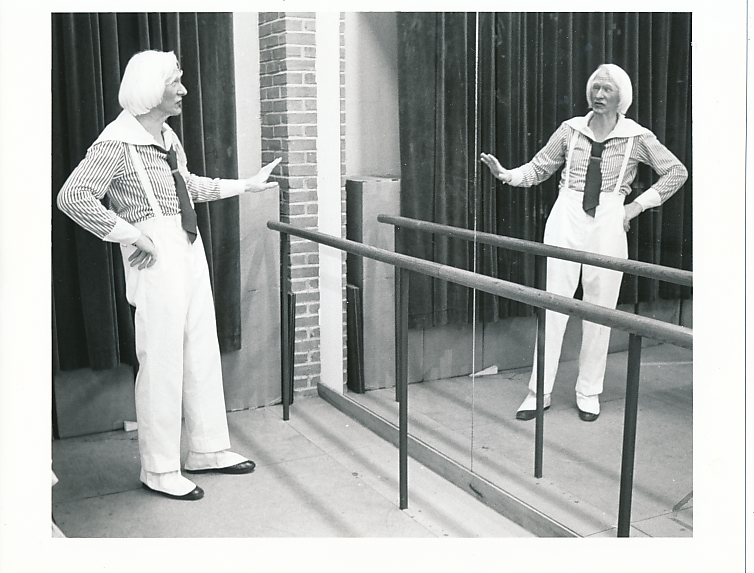 He had a wonderful singing and tap-dancing instructor in Music Professor Teresa Radomski. Ed working on his character for HMS Pinafore. Photo by Susan Mullally. 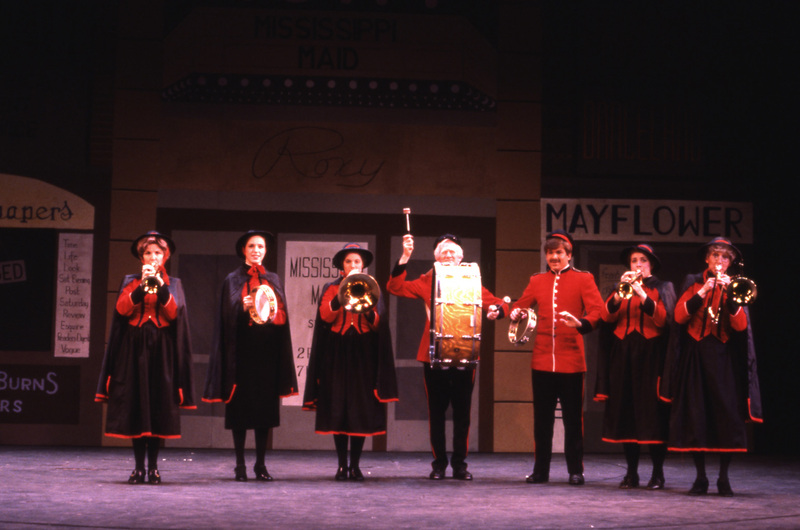 ♦ Guys and Dolls (1983), directed by James Dodding — Ed played Arvide Abernathy, a member of the Salvation Army Band and a wonderful music teacher in David Levy. He sang a memorable solo of “More I Cannot Wish You” to the character Sarah Brown, played by Allyson Currin: “More I cannot wish you than to wish you find your love, your own true love this day…” Later, when Ed performed Allyson’s wedding, he sang this song to her at the rehearsal dinner. Photo by Sarah Turner, courtesy of Wake Forest University Theatre. ♦ Servant to Two Masters (2003), directed by James Dodding — Ed played Il Capellano, a Very Special Waiter. “Being in a play is like living in New York, and I’m thankful to have lived in the big apple and tasted some of this one. On our way to the Macy’s parade, the subway became like the ark, a bit crowded at 86th Street, and a woman yelled at the new arrivals, go back where you came from, no way in New York, as the train moved on. Live by surprise and discipline in the midst of every conflict, thus every drama. Survival becomes a talent, and you can discover gifts you never knew are there. “This play provided a chance for some to renew their quest for imaginative action, hard work, fun, while others of us begin with Wow! John McQueen, given the part of the boy Jesus says, I’ve always wanted to be an actor, yes. At the bakery, a woman offers thanks for the play, and at the library this afternoon, another says how much she enjoyed it, especially the finale, where she did sing but not too loudly because others did not, but she was moved. I felt I had to tell Mr. Dodding that. Many thanks to the Wake Forest University Theater faculty and alumni for sharing these stories.